The large appetite of the lionfish is not the only threat for local ecosystems; the high speed at which they reproduce is concerning as females are able to produce millions of eggs each year. “They produce 50 000 eggs every three days. While we might have killed over 1000 lionfish, you can see how long it will take to remove all the eggs produced from just one lionfish,” explains Kristin. Projects Abroad volunteers are trained by conservation staff to use a basic pole spear with a band that wraps around their wrists; they are also taught how to spear the fish. 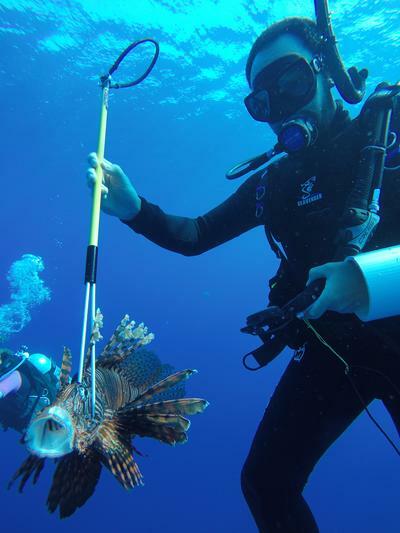 Once captured, lionfish do not go to waste. While underwater, volunteers place the dead lionfish in a make-shift five-gallon container, and once on shore, the venomous spikes are carefully removed and the fish is prepared for consumption. Their spikes are also used in local markets. “Some locals make jewelry of the spines; you find them in little shops and as arts and crafts. I have my own necklace,” remarks Susannah. 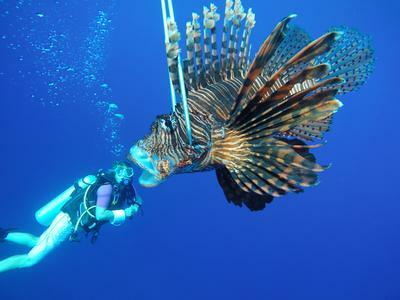 Lionfish are not only a cause for concern in the waters off Belize but have also been a pest along the coastline of the Bahamas, the Gulf of Mexico and the Atlantic Ocean. They have now also been spotted in Italian waters, proving an even greater need to control the species. Find out how you can contribute to our Conservation Project in Belize or take a look at some of our other Conservation & Environment placements around the world.